Liverpool FC Foundation, the Club’s official charity, has announced that it will welcome AC Milan’s legends team, Milan Glorie, to Anfield for the third official LFC Foundation Legends game in March next year. Both teams will be revelling in fond memories of European Cup finals, Istanbul 2005 and Athens 2007, and will be excited to confront each other again at 3pm on 23rd March 2019; with members of those incredible squads, including Jamie Carragher, Jerzy Dudek, Djibril Cissé, Vladimir Smicer and Luis García, and AC Milan’s, Ricardo Kaká, Andrea Pirlo, Dida, Massimo Ambrosini and Gennaro Gattuso. Liverpool FC Ambassador, Robbie Fowler, will captain the Reds in the hope of claiming another memorable victory against the Italian side, which will be led by Paolo Maldini. Paolo Maldini, captain of The AC Milan Legends team said: “It’s a true honour to be part of this great match. Games against Liverpool have always been hard-fought battles until the very last minute. It’s great to have the chance to relive such moments in this special stadium. Let’s hope that Anfield, with its unique atmosphere, will be sold out. For all the members of the Milan Glorie team it is also very important to support the charity projects of Liverpool FC Foundation and Fondazione Milan through this event”. LFC’s top goal scorer, Ian Rplayer-manageras player manager for the Reds, overseeing the former players confirmed, which also includes Patrik Berger, Steve McManaman and Jason McAteer. The Milan Glorie team will also feature footballing stars including Massimo Oddo, Alessandro Costacurta, Serginho and goalkeeper, Christian Abbiati. Proceeds from the match will go to the LFC Foundation, which aims to create life changing opportunities for children and young people, and a proportion will be donated to AC Milan’s official charity, Fondazione Milan. Fondazione Milan works to empower the life of new generations with the values of sport, and will allocate the proceeds of this charity game to its projects in Milan suburb areas, to support youngsters at social risk or in danger of dropping out of school. 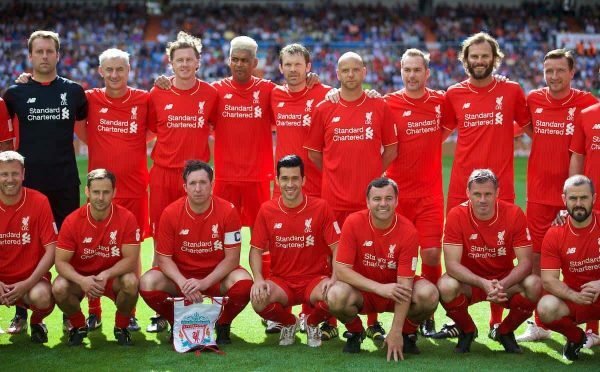 Money raised from last year’s Legends game has helped to fund a variety projects for the LFC Foundation and its charity partners, including the MOVE project at Alder Hey which is successfully helping local children with Cystic Fibrosis by providing tailored physical activity to improve their health and quality of life; and the LFC Foundation’s new Onside project, which is implemented in association with Merseyside Police and North Liverpool schools, to prevent the involvement of young people in gang and youth crime. Tickets for the game are priced at £22 for Adults, £5 for Juniors and £15 for Over 65’s. Tickets will go on sale to Season Ticket Holders and LFC Members from 11am on Thursday 6th December. Tickets will be on general sale (including LFC fan card holders) from 11am on Monday 10th December.